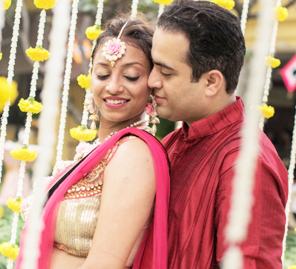 Gita and Anand’s wedding bore themes from the places that held the greatest significance in their lives. 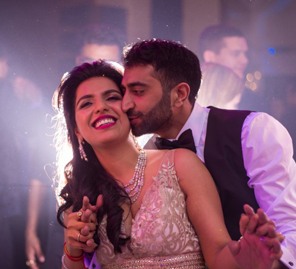 Gita and Anand met each other on a girls’ night out! Their start may have been unlikely but as partners, they are as likely as it gets! 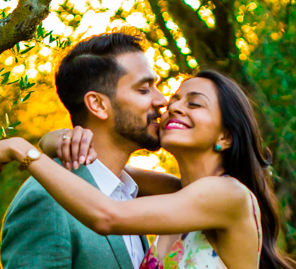 The bride shares with us their story and the highlights of their big day. “We wanted a destination wedding but a destination that bore significance to us. So we were torn between Kerala and Bali. Kerala is where our roots are but the monsoon would have been an unwelcome guest at our wedding. Bali is where we took our first trip as a couple and it’s where we exchanged our first “I love you”. It was one of the best times we’ve had though we also had big fights on this trip. All in all, this vacation showed us the best of our relationship and made our bond stronger. Our wedding planners were Eventures Asia, who did a fabulous job despite the weather challenges we faced. They were ready with a plan B before we knew it! “We wanted a meet and greet for all our guests right at the start so they could have fun together during the wedding. The welcome party had a Moroccan theme: drapes, rugs, and lamps. Our backdrop was gorgeous and kept changing colors. We also had a photobooth and a tarot card reader. This was such a memorable event for a various reasons. My mother is the shyest person ever and for the first time in my life, I saw her getting onto the dance floor! Anand had never seen his dad do shots until that night. The tarot card reader was dishing out people’s stories to them complete with instances from their lives which she could not have known, so a lot of our guests were having a crazy time there. “We had a bohemian, floral set up for this pool party. We hung elements on all the trees around the pool and DIYed a lot of the decorations. We got borders, tassels, earrings, etc. from one of our visits to Colaba Causeway and incorporated them into this setup. Our aim was to make this function as engaging and as fun as possible. We planned lots of activities, had fun floaties in the pool, a pool volleyball setup, giant Jenga, beer pong, shisha, foot massages and of course, mehndi artists tracing patterns using both, traditional and white henna. We even had a photobooth with a massive floral backdrop in pastel colors. “We wanted to introduce our guests to the Balinese culture so at our sangeet, we recreated a Balinese village. We had string lights everywhere to create a starry night. We had lots of frangipanis, a flower native to Bali, scattered on the tables and we used Tanjore paintings since they are such an intrinsic part of their traditional decor. Local fire dancers flagged off the evening and danced to not just the native tunes but also songs we had curated. The list included Taal’s title track! This was followed by performances by our friends and family who said a few words about Anand and I before they started dancing. We wanted to create an easy and warm atmosphere as if this were happening in our own living room. We successfully managed that and this approach was very well received by our guests. “The day started with a scare! Our wedding was going to be on a cliff with a view of endless waters as backdrop. At 7 a.m. we got a call from our planners saying that because of the rains and the winds, we may have to shift the wedding indoors. While this was my dream spot, I decided come what may, nothing will affect how happy I was going to be that day. It sounds funny but within 15 minutes of me saying that, the skies magically cleared up and the weather turned pleasant! It was as if this was a mini test I cleared. 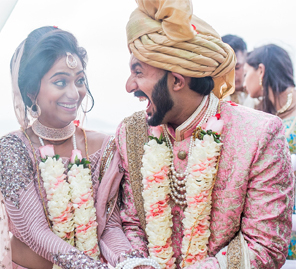 We had a Mughal style mandap and stuck to a pastel palette. My bridesmaids wore Kerala style sarees while the groomsmen wore Kerala lungis paired with Bali shirts. We had a traditional dhol player who played the tune that will always be close to my heart as I walked down the aisle. I grew up in a very traditional household where my father would play this one bhajan (hymn) every morning. As time went by, that tune started to bear so much meaning to me and having that played on my wedding day made the ceremony so much more special. “We served a sadya, a Kerala style celebratory lunch that follows every traditional wedding. However, since we had several international guests, we did the lunch with a modern twist. White wedding decor created a contemporary ambiance. Everything else was kept traditional. We served them on banana leaves and the flavors were hundred percent Indian. This was so well received. It was so heartwarming to learn that everyone likes South Indian food so much!